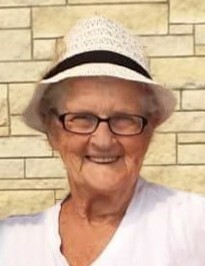 Bev Donarski, 79, of Grand Forks, ND, passed away unexpectedly in her home on Monday, April 30, 2018. Beverly Jean was born on May 26, 1938, in Warren, MN, the daughter of Leona and Florian Duray. She grew up west of Argyle, MN, on the family farm and raised primarily by her maternal grandparents, Henry and Synneva Marshall. She attended country school, walking there every morning with her lunch and books in a milk pail. Bev was married to Nick Donarski Jr. on October 4, 1956, in Assumption Catholic Church in Florian, MN. The couple made their home and raised their eight children in rural Marshall County, which she always considered “home.” Her primary vocation in life was motherhood, and she spent many years as a homemaker, eventually ending up in Oslo, MN, where she continued to work hard for her family. After her children were all grown, she found her new vocation: grandmotherhood. Grandma Bev was the first teacher to each of her grandchildren and babysat for all of them. She was very involved in their lives; from playing and baking, to teaching reading or sharing her love of Alan Jackson; Bev's life's work was her family's well-being. She will be remembered as a 10+ year cancer survivor, a lover of rummage sales and Twins games, and a loving “pet parent” to her dog, Lily May. Bev is survived by her children, Thomas (Jocelyn) Duray of St. Paul, MN, Cindy (Jeff) Boman of Warren, MN, Cheryl (David) Penn of Pacheco, CA, Gary Donarski of Oslo, MN, Melissa (George) Donarski of Warren, and Tammy Scott of Grand Forks; 26 grandchildren; brother, Gerald (Judy) Duray; and numerous great-grandchildren. She was preceded in death by her husband, Nick; two sons, Scott and Timmy; granddaughter, Trish Boman; and her parents and grandparents. your care for our mother and grandmother was incredible. MASS OF CHRISTIAN BURIAL: Saturday, May 5, 2018, at 10:30 AM, in Assumption Catholic Church, Florian, MN. VISITATION: One hour prior to Mass. INTERMENT: Assumption Catholic Cemetery, Florian.